The RHA continued in its work on the May Barn which was moved to the Old Stone House property in 2008. Last year saw the addition of stairs to the hayloft, which has been a favorite destination for the scout troops who tour the Old Stone House. Electricity was added to the barn to enable lighting for our growing collection of old fashioned farm implements, horse grooming equipment and our antique sleigh – which used to sit outside of the Old Stone House. All the work has been done by a group of volunteers and everyone has a say in what to do next as well as how to do it. Since there are no definitive records of exactly what the barn looked like when it was built in the early 1800’s, we research what some of the likely features and materials would have been in barns of the period. For example Andy Clark who heads up our building and grounds, figured that to get bales of hay into the hayloft there must have been a pulley above the hayloft door and sure enough there was evidence that the barn had, at one time, support for a peak beam in just that location. So we procured an antique barn pulley on eBay (a bargain at $17) and installed it. “Once it was in It just looked like it had always been there” remarked Kurt Pralle, longtime RHA board member. 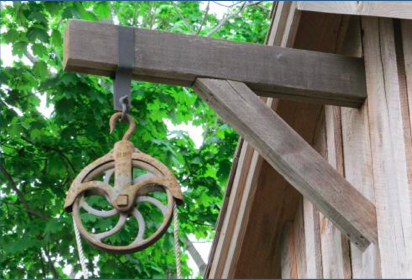 Antique Pulley and peak beam as it looks today on the May Barn. The RHA acquired the pulley on eBay for just $17!